What are Forklifts Used for | Why are They Needed in Warehouses? Are you thinking about becoming a forklift driver? Are you looking for a well-paying job in a warehouse setting? Then there’s a pretty good chance you’ll use a forklift – in a warehouse, of course! 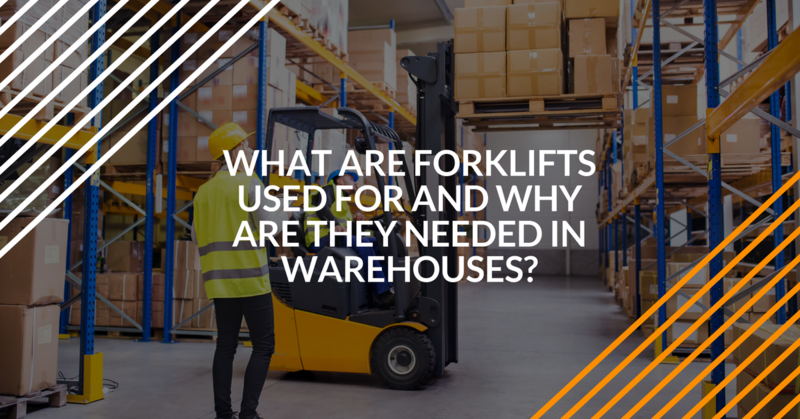 But what are forklifts used for, and why are they needed in warehouses? This article will look at the different tasks forklifts are used for, how forklifts increase a warehouse’s productivity, and also a few forklift safety tips. Plus, we’ll also review the differences between forklifts and their close cousin, the pallet jack. What are Forklifts Used For? Heavy-Duty Lifting, and Much More! Forklifts are part of the powered industrial truck family of equipment. According to OSHA, forklifts make up the largest percentage of powered industrial trucks. Every type of forklift has its own unique features. Some forklifts are designed to handle lighter loads. Others are made for heavy-duty lifting. Smaller, faster forklifts work well in a busy warehouse setting. Rough terrain lifts are made for rough-and-tumble construction sites, heavy machinery maintenance, and much more. If you’d like to know what forklifts are used for, it helps to know the different types of lifts available on a job site. The type of forklift you’ll use depends a lot on which type of task you’re assigned to do. If you’re involved with organizing and storing cargo at a warehouse, an indoor stand-up lift is a great choice. For outdoor job sites or work areas that require more lifting power, construction-ready lifts are used. For warehouse activities, Class I – Class V powered industrial trucks are most common. For most forklift drivers, the first type of powered industrial truck they usually drive is the Class I type. The Class II lifts (narrow aisle trucks) are used when space is tight. Aside from the class of forklift, the design also determines what forklifts are used for. High-lift trucks, straddle trucks (used for stacking ISO containers), cantilever lifts (used for handling longer cargo like pipes and steel bars), and low-lift trucks are used in warehouses all across the country. Regardless of the type or design of forklift, anyone that operates a forklift is required to take OSHA approved safety training. That’s where FLC can help! We also offer pallet jack training. But what are the main differences between pallet jacks and forklifts? Load capacity. Pallet jacks have a much smaller load capacity than forklifts. Lifting capability. While pallet jacks are used to keep pallets elevated only a few inches above the floor, forklifts can hoist cargo up to tall warehouse shelves. Operator position. Forklifts have standup or sit-down configurations. Many lifts allow the driver to control their equipment from a variety of positions. But most pallet jacks are standup style. Approach corners and blind spots with caution. Pay attention to your forklift’s max load requirements. Never drive with an elevated load. Conduct regular maintenance checks and inspections to ensure safe operation. Here’s another crucial forklift safety tip: never operate a lift without OSHA approved training. FLC’s three training packages are perfect for getting OSHA compliance without breaking the bank. If you need OSHA compliance, get started today. For questions about our training, or if you’d like to know more about what are forklifts used for, call us at (888) 278-8896.